Omni Hotels & Resorts creates genuine, authentic guest experiences at 60 distinct luxury hotels and resorts in leading business gateways and leisure destinations across North America. With over 20 world-class golf courses and award-winning spa retreats, to dynamic business settings, each Omni showcases the local flavor of the destination while featuring four-diamond services, signature restaurants, Wi-Fi connectivity and unique wellness options. Known for its distinguished, personalized service, Omni leaves a lasting impression with every customer interaction, with a heightened level of recognition and rewards delivered through its Select Guest loyalty program and the company’s “Power of One” associate empowerment program. The brand is frequently recognized by top consumer research organizations and travel publications. As part of its award-winning Sensational Kids program, Omni Hotels & Resorts is unveiling something new this year to woo its youngest guests – the redesigned Omni Kitchen Kids backpack. The new backpack is brimming with entertaining and family-friendly health and nutrition themed games and goodies to promote healthy eating while on family vacations. The bag design features fun and engaging characters based off fruits and vegetables. Traveling parents are invited to enjoy a stress-free check-in at each Omni property, where children are greeted with their very own Omni Kitchen Kids backpack. Inside they will find unique and amusing items including a Twisty Tomato plastic drinking straw (they receive the corresponding colorful plastic travelers’ drinking cup at a hotel’s restaurant), a cartoon matching memory game, washable crayons and a fun-filled activity book packed with games, puzzles, amusements and other diversions. 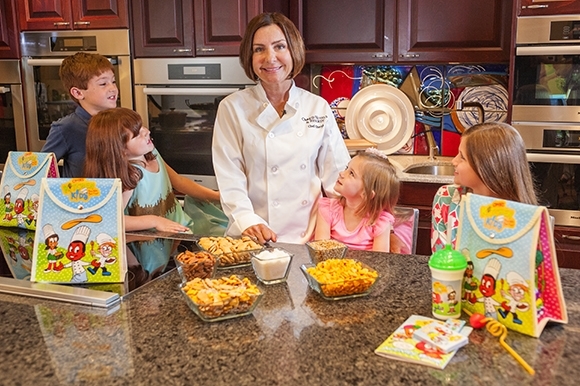 The activity book also includes recipes created by Omni’s Brand Nutritionist, Chef Forberg R.D. Kids and parents alike will find that the savory snack recipes are as much fun to eat as they are to make. Travelers may view Chef Forberg’s recipe for Zoo-licious Trail Mix at Omni’s “Healthy Traveler” video series by visiting www.omnihotels.com/kitchenkids. The seven-part “Healthy Traveler Series” narrated by Forberg, will be released throughout the year, and features a number of videos around easy tips for maintaining a balanced lifestyle for the everyday traveler. Forberg, one of the nation’s leading authorities on nutrition, a James Beard award-winning chef, and nutritionist for NBC’s “The Biggest Loser,” joined Omni Hotels & Resorts in 2013. She has worked closely with Omni chefs to create both delicious and nutritious menu choices from Omni’s award winning restaurants, in-room dining, and banquet menus. “We know that top-rated children’s programs are about more than arts and crafts, a pool and a playground – parents want their children to have fun during their trip while learning something in the process,” said Tom Santora, chief marketing officer and senior vice president of sales for Omni Hotels & Resorts. “One of the great things about working with one of the top nutritionists in the country is leveraging her knowledge on how we could help kids learn to make better nutrition choices while they are traveling. The Omni Kitchen Kids backpack is an entertaining and engaging way to do that. Omni Hotels & Resorts is renowned for providing one-of-a-kind Omni Kid’s suites at select properties in Texas, California and New England, setting a new creative standard for kids-centric hotel suites. Each unique Kid’s suite features colorful children’s furniture and bedding, beanbag chairs, games, books, an art center and more, with a connecting room for the rest of the family. Omni provides customized family packages, summer kids’ camps and activities at its 14 different, and distinct, Resort Collection properties across North America. From swimming classes and poolside movie nights to scavenger hunts and paintball to water slides and falconry lessons, there is something for every child and inner child.